Welcome to the six hundred and ninety-first of my blog interviews with novelists, poets, short story authors, biographers, agents, publishers and more. 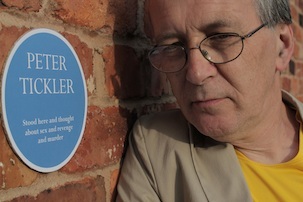 Today’s is with crime novelist Peter Tickler. A list of interviewees (blogged and scheduled) can be found here. If you like what you read, please do go and investigate further. Morgen: Hello, Peter. Please tell us something about yourself, and how you came to be a writer. Peter: I think writing crept up on me when I wasn’t looking and prodded me in the ribs. My first published piece was one on war-gaming, when I was about 18. I was thrilled when the magazine not only published it, but sent me a cheque for £20. I sent two more articles. They published those too, but somehow no further cheque ever arrived in the post! Morgen: Oh dear. My first published piece was a 60-word story in Woman’s Weekly for which I got £10 (not a bad word rate). I’d sent them a whole page of stories and the one they picked (‘Pizza Payback’ which they renamed ‘Payback’) was the first one so I thought they’d print more but sadly they stopped doing the 60-worders a couple of months later. You generally write crime novels, have you considered other genres? Peter: Not as yet. I have written a number of monologues based on biblical stories for my local radio station, but I’ve never tried other fiction genres. Morgen: You have had three novels published to-date? Have you ever been tempted, or indeed written, under a pseudonym? Peter: No. I guess I’d have to be pretty embarrassed about what I had written to do that. Morgen: 🙂 Your books are available as eBooks – how involved were you in that process? Do you read eBooks or is it paper all the way? Peter: When I signed my contract for Blood on the Cowley Road, electronic publishing rights were not even included. Later they sent me an addendum to sign. As far as I am concerned, eBooks is something that happens at some point after the hardback has been published, with no extra input on my part. Morgen: It’s very easy to do (I have a guide for indie publishers to do their own) and the great thing is if you wanted to change anything (perhaps update factual events), it’s just a case of re-uploading a Word document. You mentioned hardbacks, are they released first in that format and then in paperback? Do you think the format matters? Peter: Yes, they are, but interestingly the time gap between the publication of the two has become increasingly shorter. Morgen: I know a couple of authors whose publishers have stopped doing hardbacks and Amazon sell less of them than any other format, which is a shame because I prefer them to paperbacks (I’m a don’t-like-damaging-paperback-spines reader). Your books are set in your home area of Oxford, how important is location to your writing and have you had reader feedback about the city? Peter: I love writing about Oxford because I have lived there so long (and also studied as a student). Describing it accurately is important to me, though of course sometimes I do just make buildings and even streets up. But if I can set a scene in an ice-cream shop that really exists (see Blood on the Marsh for that), I will. People seem to really like the authenticity of the locations. One man queried my depiction of Grandpont as being Labour voting and Guardian reading, but it turned out he had lived in Grandpont thirty years previously. Morgen: Oh wow. That’s the joy (or sometimes the opposite) of reader feedback. I love it – even when I had a lady on Goodreads say she hated one of my stories (Feeding the Father, based on a true story) so much she vowed never to read anything by me again (which is a shame because she’s previously said how much she’d loved another (April’s Fool). You’re a fan of the football club, Oxford United, and you wrote for their programme recently, has the club, or the sport, ever featured in your fiction? Peter: There are always references to Oxford United. I have set scenes in the Oxford Mail stand and the boxes, some Oxford fans get killed, and Blood on the Marsh was inspired by a real Oxford United match. In addition, all my solicitors share surnames with players I have enjoyed watching. Morgen: That’s funny. I bet the players are chuffed. Oxford is the basis for Colin Dexter’s Morse – minus the frequency of the murders, how realistic are his novels and the TV series to Oxford life? Peter: If you read Dexter’s novels, they are much more town-centred than the TV versions and as such much more true to Oxford as a city. There is a lot more to Oxford that Oxford colleges and students. I have to admit I get fed up with the way the Lewis TV series is so centred on a few university buildings and I guess I set out to avoid that in my books. Morgen: It’s interesting that book:TV are that different. I met you at an author talk, here in Northampton, recently and there are various literary festivals in the area, including the Sunday Times Oxford Literary Festival and the Chipping Norton Literary Festival. How important are live events to you, and to authors generally? Peter: Personally I think any public exposure is helpful to authors. I recently did a ‘gig’ at my first festival (in Wantage), but I have spoken at libraries in several counties, U3A meetings and even one of Her Majesty’s Prisons. It is important to put yourself out there and also I find it a lot of fun. Of course the big festivals are dominated by the big authors, so they are not much help to smaller authors like myself trying to grow their readership. I was invited to speak at Wantage after the organiser saw me talk at a library, so that was very flattering. Morgen: Hopefully Chipping Norton will ask you at some stage. I’m been a volunteer there so I’ll put in a good word. 🙂 In the video on your website’s home page, you encourage readers to borrow your books from the library (I’ve heard that some authors actually earn more from library borrows thanks to PLR) and indeed I met you at the aforementioned library talk (with Stephen Booth), how important are libraries to writers these days? Peter: For smaller writers, libraries are very valuable for both buying copies and then lending them out. PLR on my three published crime novels is into three figures, so it is a handy bonus to the royalties. Libraries also lend out e-books now, which generates not PLR but some extra royalties. Morgen: Oh, do they? That’s interesting. I read more eBooks than any other format, although I volunteer at a Red Cross shop so some of my paperbacks come that way (or from author talks). Do you have a favourite of your books or characters? Peter: My main character is Detective Inspector Susan Holden. She is a rather sharp and aggressive, and not especially sympathetic, but I am very attached to her. She also has a sparky relationship with her long-suffering mother. In the current manuscript, she is attending anger management sessions – I am not sure if that will change her, but I shall love her nevertheless! Morgen: Sharp is good. There’s little more annoying than a ‘damp squib’ of a main character. If your books were audiobooked, whom would you have as the narrator(s)? Peter: Olivia Colman or Helen Mirren if either were available – as long as I get a chance to meet them over lunch! Morgen: I’d be happy with either of those. Which authors did you read when you were younger and did they shape you as a writer? Peter: Enid Blyton (Famous Five series), Rosemary Sutcliffe, Mary Renault and Daphne du Maurier. I think they convinced of the joy to be found in reading a good story. Morgen: All writers should be readers too. <note to self: read more!> Did you choose the titles / covers of your books? Peter: I chose the titles. Blood on the Cowley Road was a bit of a punt on my behalf for my first book, but the publisher went along with it. In fact it was a good choice because the Cowley Road resonates with anyone who has lived in Oxford for any length of time. I don’t get involved in my book covers, except when I had to ask my publisher to change the footwear of the woman on the Blood in Grandpont cover. I pointed out that a woman who has just come into a house in December in bad weather was unlikely to be wearing fragile sandals – so they agreed to give her ankle boots! Morgen: It’s amazing how many covers don’t reflect the contents. I guess they’re created to sell the book but then they’re running the risk of the reader feeling mislead and that’s never good. What are you working on at the moment / next? Peter: Another book in the Blood on Oxford series, though I also write a monthly column for Mystery People’s e-zine and from time to time, write pieces for Oxford United and BBC Radio Oxford. Morgen: Do you manage to write every day, or ever suffer from writer’s block? Peter: No and yes. I am trying very hard to write every day at present as I think it is important to keep the flow going in a novel even if I know some of it will have to be jettisoned in the second draft. Writer’s block occurs when I really don’t know where the story is going or when I am trying to come up with a brand new plot. This only becomes an issue if the block lasts a long time! I do have two other lines of work, so writing sometimes has to take third place! Morgen: That’s a shame, although hopefully you enjoy all three. I find if I get stuck on one project then there are plenty of others to be working on until I come back to the first and I usually crack on with it then. That’s why it’s recommended to put work away when it’s done so you can edit it easier when you return to it – so it feels like someone else’s writing. I’m also a freelance editor and it’s so much easier to edit other authors’ writing. I’ve recently finished editing a YA dystopian novel, am nearing the end of another before cracking on with a historical and an erotica (all by different authors and all due by the end of November) so it’s certainly enjoyable having varying genres (and different to those I write). Do you plot your stories or do you just get an idea and run with it? Peter: A bit of both. The first one (Blood on the Cowley Road) was plotted in considerable detail, but I think things work better if you don’t try and be too prescriptive in the beginning. For the current novel, I know how it is going to end (and who did it!) but I don’t know the exact route the story will take. It is a truism, but sometimes you really can be led up unexpected paths by the behaviour and foibles of your characters, and as a writer that is really interesting and enjoyable. It can, of course, also be a bit scary! For me, the story begins when I get a strong idea of how it starts. Morgen: I’m the same. I’m about to write my eighth novel (all but one are still in their files!) and I only plotted the first one. For TSDSL, which I wrote for NaNoWriMo in 2009, I had no clue what to write about until two days before and ended up writing 117,540 words in 28 days so I’m very lucky that it does just flow. You mentioned your DI, Susan Holden, do you have a method for creating your characters, their names and what do you think makes them believable? Peter: No method. I guess I am still learning. I think it is helpful to have very distinct characters, even if that isn’t necessarily true to life. In a 70,000-word book, you can’t develop characters too deeply, but you want readers to identify or understand them, even if they aren’t necessarily nice. Morgen: Absolutely. If a reader can’t identify, or have empathy with, a character then it doesn’t matter how good the plot is. Do you do a lot of editing or do you find that as time goes on your writing is more fully-formed, and does your editor make many changes? Peter: In terms of style, I am pretty comfortable with what I write. I think a detached editorial eye is valuable for identifying plot problems and inconsistencies. And as a writer you are so close to your material that it is easy to miss glaring typos. Morgen: Is certainly is, so I hire an editor for my writing. Do you have to do much research? Peter: I am not sure I feel the need to do too much research, but when I do need information on, for example, what happens to a body when it is hit by a train at 60 m.p.h., it is easy enough to find someone to help via the internet. I also have a police contact who helps me with questions like: what would the police do in these circumstances. But I don’t let it take up too much time. Research sometimes involves wandering round some part of Oxford or other Oxfordshire location to get a feel of the place. Ian Rankin doesn’t embark on research until he has written his first draft. That seems a pretty sensible approach to me when writing crime fiction. Morgen: I tend to agree. I’ll put ‘MORE HERE’ if I need to come back and fill something in, because I find flicking over to Google (other search engines are available) stops the flow. What point of view do you find most to your liking: first person or third person? Peter: I think third person offers more scope for bringing in different characters and maybe varying the pace and settings, and I mostly use that. However in Blood on the Marsh I have a first person narrative at the start of each chapter and that works well. I use to write Biblical monologues for the radio and I really enjoyed that as it enabled me to get inside the skins of any character I was interested in. The concept of the unreliable narrator is something that really appeals to me. Morgen: You’ve received various reviews of your books (including eurocrime.co.uk’s), do they affect you or your writing? Peter: I would be lying if I said I didn’t like good reviews. If you get a bad review it hurts, and of course you are bound to get some bad ones, especially on Amazon, and sometimes they are so unfair or stupid it does get to me. When I write a review for a film or a play (for Daily Information, in Oxford) I always try and discuss what is good and/or interesting about it. It is easy to find something to slag off in other people’s creative work. A writer is sticky his head up above the parapet and I think he/she should be given respect for that fact alone. I guess reviews do make me think about my books, but it is often personal conversations that have more affect on me. Morgen: With some reviews you do wonder whether they’ve actually read the book, probably why Amazon introduced ‘verified purchaser’. Do you write any poetry, non-fiction or short stories? Peter: I have written a non-fiction book, The Modern Mercenary, which was surprisingly successful and even translated into Portuguese, but that was a long time ago. Poetry really isn’t my thing. I do have some short stories tucked away on my computer, but haven’t had them published as yet. Morgen: ‘Yet’, I like that. See aforementioned eBook guide. 🙂 Do you have pieces of work that you think will never see light of day? Peter: Of course, inevitably there is stuff that you start writing or ideas that you try out to see where they lead, and sometimes they lead to a dead-end – or at least they appear to! But you never know where they might lead in the future. I think I ought to occasionally go back over my old stuff and see how it strikes me now. Morgen: Hopefully you’d be pleasantly surprised (having had more experience / practice since then). Have you had any rejections? If so, how do you deal with them? Peter: Yes. 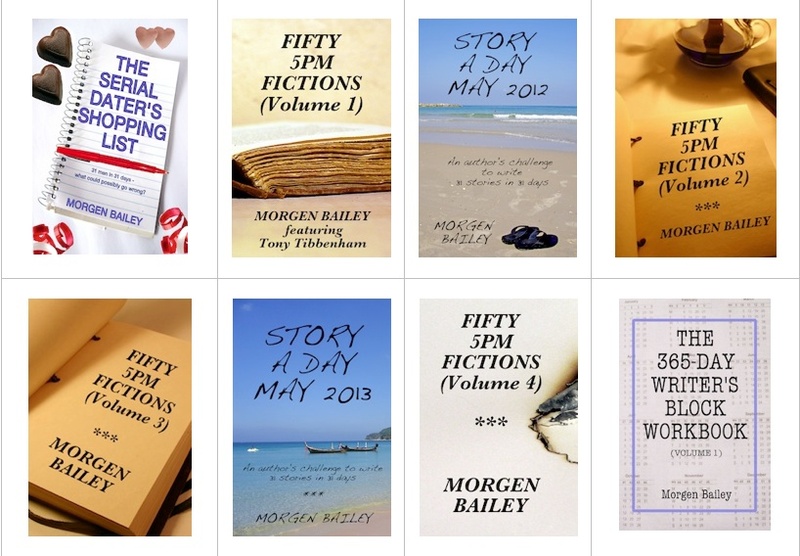 I wrote a number of short stories that I hoped would get published by magazines. I also had a book accepted for publication by my publisher, who then got bought and sold twice within a very short time. The eventually new owner promptly decided they didn’t want to publish it. They paid me off in full, but it was very upsetting at the time. One of my fiction novels was rejected for being too complex (and maybe other reasons too, I suspect). When that happens you have the option to give up or to dust yourself down and try again. But of course it’s a painful experience. Morgen: What a shame. Still, you have them to do something else with. Do you enter competitions? Peter: I won a hamper of chocolates recently, but it wasn’t a writing competition! Morgen: Congratulations. Do you have an agent? Do you think they’re vital to an author’s success? Peter: No, I do not. They are not vital, but I am sure they are worth having. My impression is that a good agent is valuable in giving feedback on your work before it gets anywhere near a publisher. Agents also know the market well, so can direct you to more lucrative areas! Morgen: Good ones, certainly. I do think they worth their commission because they’d also be able to barter… er negotiate with more power. Do you do much marketing for your published works or indeed for yourself as a ‘brand’? Peter: I take every opportunity that presents itself to get myself known. So when Oxford United ring and want an article written soonest, I write one even if it is inconvenient. When I go on holiday, I will contact libraries in the area and see if they are interested in me coming and giving a talk. I write a monthly column for an e-zine published by Mystery People. I use Twitter too (@ptickler). I am conscious I ought to put my e-zone articles out as a public blog too, but I haven’t yet done so. I gives talks to libraries, U3As, Womens Institutes etc. It’s fun and it’s a way of getting more readers. Morgen: If you’re going to blog (although I suspect you may create it as a page on your blog), I’d recommend WordPress. What’s your favourite / least favourite aspect of your writing life? Has anything surprised you? Peter: I think writing can feel rather solitary and if you’re stuck with your plot that can be very dispiriting. A rejection letter or email is always a kick in the teeth. On one occasion I had a collection of pieces that a publisher expressed great interest in. They asked if I could write a few more to bring it up to a more publishable length. I did precisely that. The editor responded very positively and said he would be in touch once he was back from holiday. I never heard from him! I didn’t realise anyone could be so rude, so yes I was really surprised. Morgen: That’s terrible. Although, again, you still have them. <looking on the bright side> What advice would you give aspiring writers? Peter: Read lots and write lots. But also think about your reader. Who is your book aimed at? If you can’t answer that question, then you’ve got a problem (unless you are a genius, of course!). But there is no need to run before you can walk (or even constantly write in clichés!) – so write for your local church, newspaper, your own blog, etc. and build your own confidence up. Just don’t expect success to come overnight! Morgen: I’m still working on that one. 🙂 Are you involved in anything else writing-related other than actual writing or marketing of your writing? Peter: I write reviews of films and plays for Daily Information from time to time. Morgen: You’re on Twitter and Facebook (any others?)? If so, how valuable do you find them? Peter: I like using Twitter, though I am conscious I am not making full use of it. I went to a talk on it the other week, so when there is a lull in my writing, I will try harder at Twitter – promise! Morgen: 🙂 I use Tweet Deck so copy / paste from pre-prepared documents (alternate blog posts and touting for blog content or my books etc) and it makes life so much easier, although I don’t seem to find time getting involved in conversations which is really what Twitter’s about. What do you think the future holds for a writer? Morgen: And it’s exciting, I think. Your website is http://www.petertickler.co.uk, how involved are you in that? Peter: My son designed it originally, but I manage it myself now. I don’t update it as often as I ought and I don’t monitor usage, so like with Twitter, my report card on that would read ‘Could do better’! Morgen: <laughs> Is there anything else you’d like to mention? Peter: Someone emailed me after a talk I gave at a U3A meeting and said I had turned her into a fan of crime fiction. That gave me a real fillip. Morgen: Oh wow. The better side of reader feedback. Is there anything you’d like to ask me? Peter: Do you know the secret of eternal youth? Morgen: <laughs> I don’t specifically, but I think not taking life too seriously helps. I try not to worry (even when my bank balance is frighteningly low) and just remind myself that I’m doing what I love. That helps me feel young (and messing about with my dog). Thank you for joining me today, Peter. One of my favourite Beatles’ songs is ‘The Long and Winding Road’. Actually it takes the bronze medal in my personal Olympics, behind ‘Hey Jude’ and ‘Eleanor Rigby’, but this is meant to be a column about writing, so enough of that! Anyway the long and winding road seems a pretty good metaphor for the process of writing a book and getting it published. A book starts with an idea and ends with a physical and/or virtual object that people can read. In between there’s a heck of a lot that can happen. Some writers are very organised and take the very direct route. Ian Rankin writes a first draft in six weeks – I read this in the Daily Mail so it must be true. He then does his research, then a second draft (throwing in red herrings etc. ), shows it to his wife for her comments and then finally a third draft before sending it to the publisher. Six months in all. ‘Simples’ as the TV meerkat would say. By contrast Michael Frayn, writing about the genesis of his brilliant Spies, says that the ‘first indistinct notions’ of the book came into being in 1991 – a tale seen through the eyes of a small boy. Only in 1996 however did it become clear in Frayn’s mind what the boy’s friend’s mysterious mother was up to. By 1999 the main plot seems to have been fairly clear in his mind and he wrote a ‘treatment’ and series of drafts over two years before it was published in 2002. But the long and winding road doesn’t end with the delivery of the manuscript. ‘There may be trouble ahead’ as the Irving Berlin song tells us: revisions requested by the publisher (‘too long’ is a familiar response in my experience) and then the vagaries caused by being slotted into the publisher’s schedule. Finally it is published. But even that is not the end. There are the delayed payment of royalties. For example, my Blood in Grandpont was offered for £0.99 by Amazon for a month in November 2012 in their under £2.99 scheme. There was a massive splurge of sales, but no money got to me until September 2013! 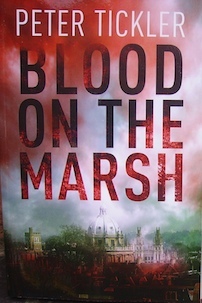 Last November was also the month in which the Canadian paperback rights were sold for my Blood on the Marsh. Eleven months later, I have just heard it will be published April 2014! Blood on the Marsh is a whodunit involving death in an care home, a real Oxford United game, railways and the theme of parenting. The reviewer in the Oxford United programme called it ‘mature, thought-provoking and highly recommended’. Who am I to disagree?